After instituting “disclosure, apology and offer” policies, hospitals have seen a drop in malpractice lawsuits. Five years ago, the University of Michigan Health System was one of a handful of U.S. hospitals that voluntarily admitted when it had made a mistake that harmed a patient. Following each admission was an apology and an offer of compensation. 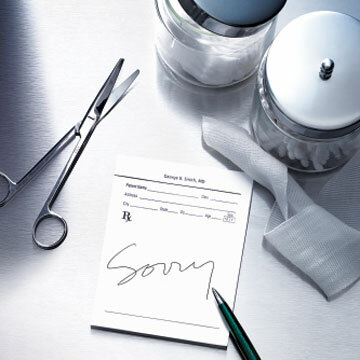 Since Proto reported on the bold experiment (“The Hardest Word,” Fall 2007) to find an alternative to the medical liability tort system, many other hospitals have begun adopting the model, dubbed DA&O (disclosure, apology and offer). Critics predicted that this alternative approach would invite more malpractice lawsuits. But just the opposite has occurred, with pioneers of DA&O reporting an impressive reduction in claims and litigation expenses, perhaps because their honesty in admitting fault—or defending their care when it seemed an adverse event was unavoidable—may dissuade some patients from filing a claim. According to a 2010 study in the Annals of Internal Medicine, UMHS had to defend an average of 38.7 medical malpractice lawsuits per year before it started DA&O in 2001. Now that’s down to 17 a year, an improvement that has cut litigation costs for UMHS by 61%, or about $2 million a year. A similar program at Stanford Medical Center begun in 2007 has resulted in a 36% decline in claim frequency and a $3.2 million savings in annual malpractice insurance premiums. And the University of Illinois Medical Center at Chicago, which started fully disclosing errors in 2006, says the number of lawsuits filed against it each year has dropped 40%. In just the first two years of the program, the medical center made nearly 200 safety improvements based on more than 4,000 adverse incident reports. Several Massachusetts hospitals are developing protocols to test DA&O. “We needed fundamental reform to improve patient safety and reduce the motivation to practice defensive medicine,” says Alan Woodward, an emergency physician and a leader of the Massachusetts reform effort. The Massachusetts Medical Society initiated legislation, recently signed by the governor, that requires a six-month waiting period before a patient can sue, giving hospitals time to perform a root cause analysis and apologize and offer compensation if appropriate. Yet could DA&O work in every hospital? Until now, only academic medical centers that employ and insure their own medical staffs have tried the approach—for good reason. When a medical mistake occurs in a hospital with a so-called closed medical staff, the hospital and its physicians are viewed as a unified entity, which allows the hospital to disclose the error and offer compensation on behalf of medical personnel. That keeps physicians from being reported to the National Practitioner Data Bank, an electronic repository of judgments, settlements and disciplinary actions against physicians. Most community hospitals (where most people receive care) have open medical staffs made up of independent doctors who must carry their own malpractice insurance. Whenever a private insurer makes a payment to a harmed patient, it must report the settlement and the physician’s name to the Data Bank, which then notifies hospitals and state licensing boards. Yet in more than 90 out of 100 cases, harm to patients is caused by insufficient hospital safety measures rather than by a reckless or incompetent act by a physician. “But the Data Bank doesn’t allow that nuance to be explained,” says Richard Boothman, chief risk officer at UMHS.